Whisk together buttermilk, garlic salt, kosher salt and 2 teaspoons black pepper. Place chicken in a large zip-top bag with buttermilk mixture. Marinate, refrigerated, for at least 12 hours (and up to 24 hours). Whisk together flour, cornstarch, baking powder, cayenne, paprika and remaining black pepper; place in a separate large zip-top bag. Lift a piece of chicken out of buttermilk mixture; allow excess to drain slightly. Add once piece of chicken at a time to bag; shake to coat well with flour mixture. Continue with remaining pieces. Pour about 3 inches of oil into a large, deep skillet; oil should only come about halfway up sides of pan. 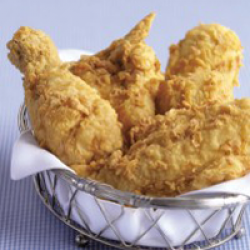 Place over medium-high heat until oil registers 350°F on a deep-fry thermometer. Drain chicken on paper towels. Serve hot.